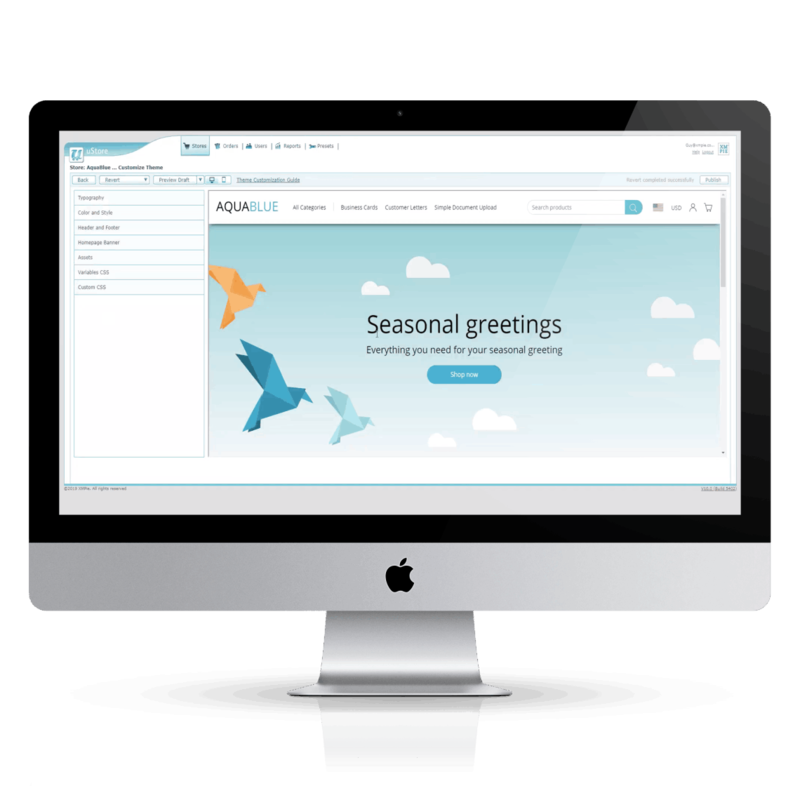 Create any web-to-print store you can imagine, and take advantage of the unparalleled capabilities of the XMPie personalization platform. Create beautiful and robust online print ordering stores, crafted upon the foundation of the ever-maturing, feature-rich backend of uStore. Modify your store theme and branding instantly and preview live, before deploying any changes. No programming experience needed; uStore NG has a new online editor built into the backend. 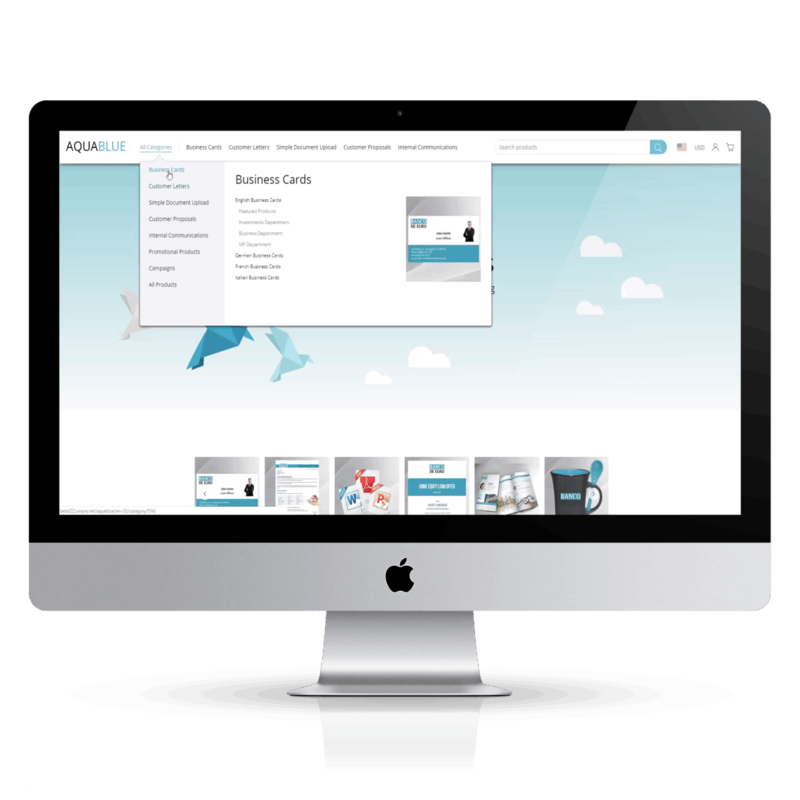 Adapt to your customers’ exact specifications by designing your own reusable theme with HTML, CSS, and code; add extra functionality, featured product areas, bespoke pages (like FAQs), personalised product recommendations, and more. StoreFlow is self-hosted and you are in control. Add as many stores as you need, for as many clients or projects that you want. There's no additional cost per product or store. It becomes part of your eco-system and ensures optimal JDF job ticketing, delivery, and MIS integration. StoreFlow isn't just a web-to-print product; it's an eCommerce platform built on top of XMPie's award-winning platform for personalization, omnichannel campaign automation. The opportunities go way beyond just selling customizable print online! StoreFlow web-to-print software includes Xerox® FreeFlow® Core, for store administrators to define multi-step workflows that preflight documents, automate imposition, and either submit jobs directly to your digital press or drop in a hot folder - everything that is needed to efficiently prepare and process Web-to-print jobs for production. uStore NG technology allows for the rapid creation, deployment, and maintenance of eCommerce sites and marketing portals. uStore 10 brings to the market not just a new version but an entirely new way of working. uStore Next Generation (NG) Technology supports a new storefront experience which follows the latest trends: it is fully responsive and designed to optimize user experience and interactivity. StoreFlow comes with a brand new theme, AquaBlue, and contains a new homepage, new header and footer areas, a new category page, and new beautiful navigation area. The new storefront experience is available for stores which are assigned the new store type – uStore NG. 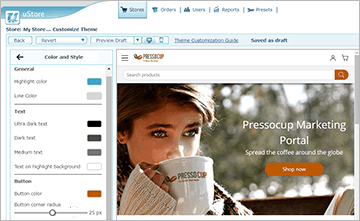 Customize the look & feel of a uStore NG store to fit your desired branding in seconds with the new WYSIWYG theme editor. 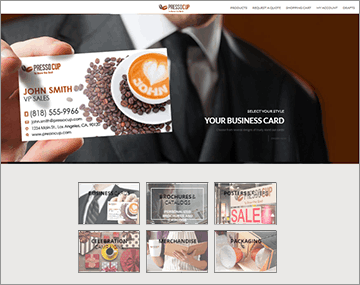 You have full control over the design elements such as fonts, colors, and images. You can preview constant changes and then publish to the online store when ready. Each product category in a uStore NG store can be assigned an image. These images are presented in the homepage and throughout the navigation. With uStore NG and the new theme editor theming stores and portals just got much more accessible. Every store can be assigned its own theme, and each store's theme can be changed in a myriad of different ways. Changing colors, typography settings and logos it just a click away, and all accessible within the online editor. Modifying or adding the theme's CSS can be done directly from the editor, as can adding in your own custom CSS. All changes can be previewed immediately before making them live in a store. Using this uStore NG, you can quickly obtain a store’s HTML and code files, and add new content, behaviors, features, and even flows. With a store's code you can start to make integral changes, like including marketing content to the homepage, replacing the banner with a slider or adding new static pages. 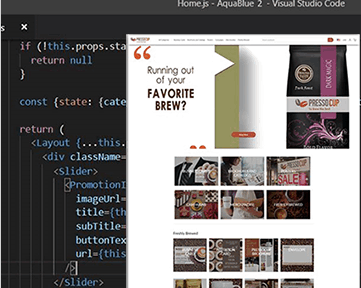 This technology uses ReactJS, one of the industry-leading technology for web development. 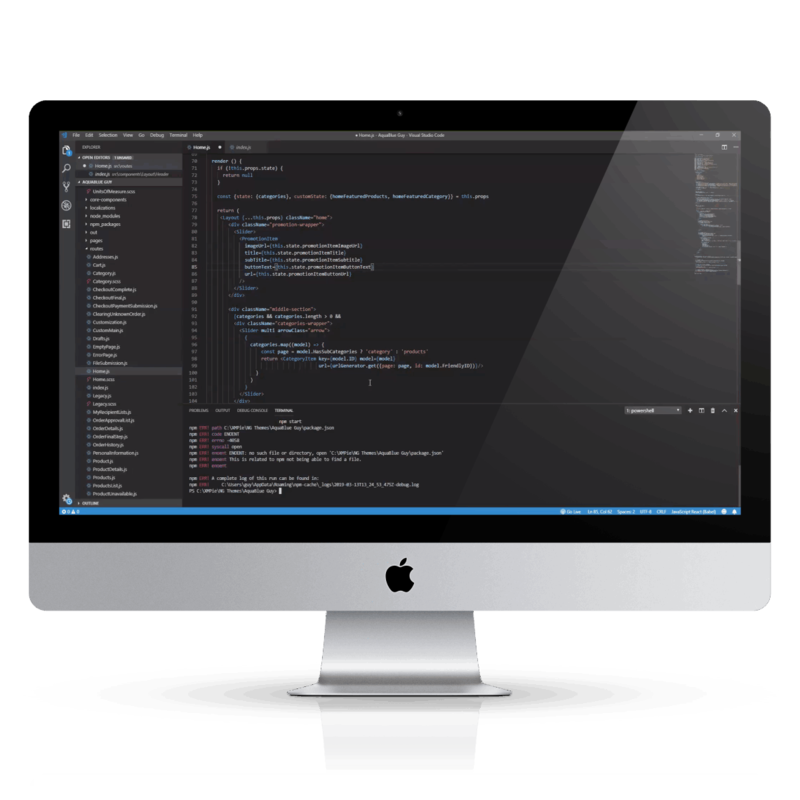 uStore NG themes are developed locally in a development environment using standard web programming tools, without affecting the production environment. 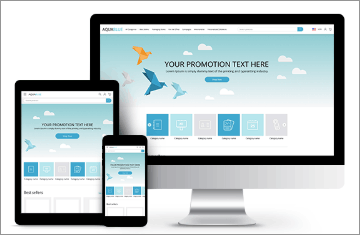 Because of the open nature of the theme and its support for industry standards, any skilled web designer/programmer can immediately start to modify or create themes. Themes can then quickly be deployed to a uStore production server when needed. With this ability to get into the depths of a store's theme it is now possible to create stores and portals that are unlike any other. Want to create a secure store, that plays a personalized video for the user upon logging in? Now, this is possible with uStore NG. Xerox® FreeFlow® Core is included within StoreFlow enabling lights out automation. Watch this short video to understand how FreeFlow Core can help automate the tasks associated with getting files ready to print. StoreFlow works in harmony with XMPie's production platform so not only can configurable, or personalized print documents be created, but you can also offer entire multichannel campaigns to be configured and sold. See for yourself how StoreFlow and uStore NG can accelerate your business.